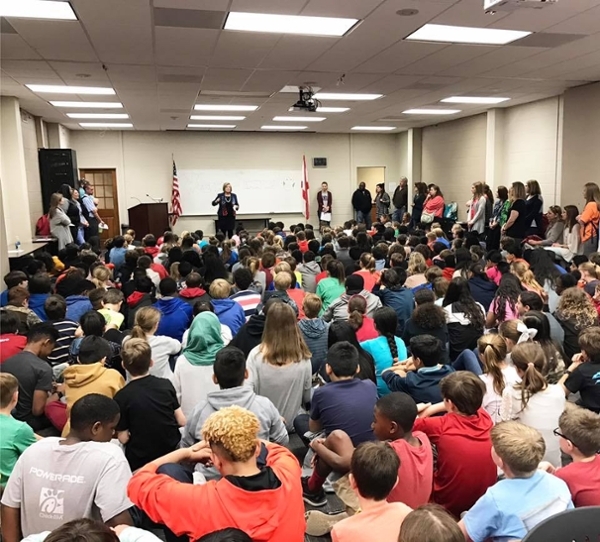 Last week, more than 270 sixth-grade students and 27 parents and teachers from Simmons Middle School flooded Samford University’s campus. The group began the day in Orlean Beeson School of Education, where they met Dean Jeanie Box, Associate Dean Jodi Newton and the Elementary/Special Education/Early Childhood Collaborative (ESEC) Junior Leadership Team. Dr. Newton began the day with an interactive exercise to help students understand why it is important that they start thinking of college at such a young age. During the interactive exercise, students were asked to imagine they were planning a trip to Buffalo, New York. “What might you need on this trip?” said Newton. Raised hands filled the room, “Clothes and food,” said one student, “A car!” answered a second. Students worked together, bouncing ideas off one another to compile a list of what they would need to get to Buffalo. Samford students from the junior leadership team planned the second half of the day. Simmons students gathered small groups and headed outside to explore campus. The leadership team created a scavenger hunt to help make the tour more interactive. Students were given clues to help them find the library and cafeteria, and to lead them through many of the buildings on campus. The clues even led the groups to Ralph Beeson’s statue for selfies. Samford’s nationally recognized ESEC program is designed to prepare students to teach a wide age range of children in a variety of grades. In fact, students enrolled in this program can graduate with four teaching certificates: early childhood education, elementary education, early childhood special education and elementary collaborative teacher. Graduates are qualified to teach kindergarten through sixth grade. Many ESEC students who previously thought they would want to teach early childhood age were surprised by how much they enjoyed working with the sixth-grade Simmons students.